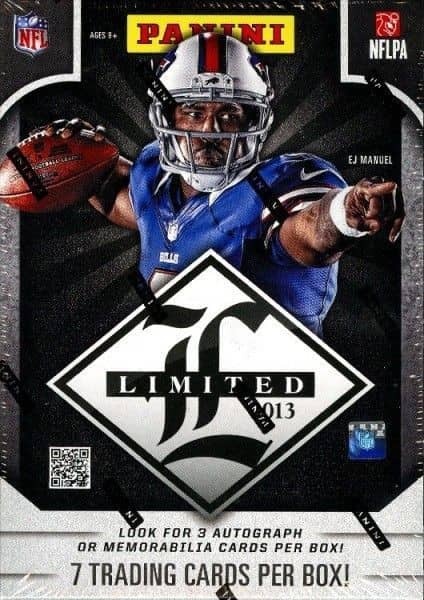 Produktinformationen "2013 Panini Limited Football Hobby Box NFL"
In 2013, Material Phenoms RC features a new design to better showcase the jumbo swatch and autograph! Look for Game Day Materials showcasing materials used from specific games of fan-favorite players. Jumbo Jersey Numbers Prime Signatures present legends and veterans with iconic jersey number die-cuts and autographs. Look for game-used Limited Threads including 1-of-1 Brand Logos! MATERIAL PHENOMS RC: Featuring a new design for 2013, the iconic Limited rookie card returns with oversized swatches and autographs from some of this year's best rookies. MATCHING NUMBERS PRIME: Pairing two of the game's notable names, this insert showcases material from players who wear (or wore) the same jersey number. Also find parallels with position die-cuts. ROOKIE LETTERMAN: Showcasing authentic letters from NFL jerseys, these autographed gems return for 2013 Limited. LIMITED CUTS: Look for cut signatures from 20 different legends, including Red Grange, Pete Rozelle and Sammy Baugh. GAME DAY MATERIALS PRIME: Taken from specific events, these game-used materials highlight some of the NFL's best players, with prime parallels. Weiterführende Links zu "2013 Panini Limited Football Hobby Box NFL"
Fanbewertungen für "2013 Panini Limited Football Hobby Box NFL"